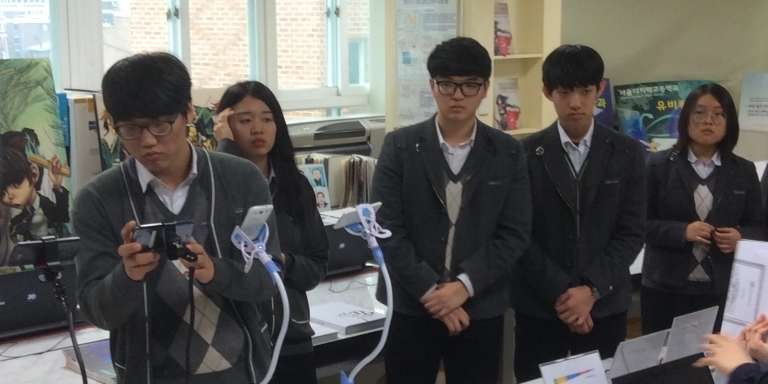 Students at the Seoul Digitech High School. The Republic of Korea has been highly successful in using master plans to embed ICT across its education system. Photo credit: ADB. Long-term planning for the comprehensive integration of ICT in education systems is critical for its success and sustainability. Successfully embedding information and communications technology (ICT) in education requires long-term plans that are closely aligned with national education goals (e.g., curriculum, teacher development) with adequate resource mobilization plans, and full stakeholder buy-in. At a workshop in Seoul organized by the Asian Development Bank in November 2016, UNESCO Bangkok program specialist Jonghwi Park described UNESCO’s support for ICT in education planning and gave insights on the underlying principals needed to ensure success. UNESCO has drawn up a strategy to guide member countries developing 5- to 6-year master plans for the adoption of ICT in their education systems. The strategy involves a careful preparation process and sequenced actions to help countries realize their goals and avoid often costly mistakes when ICT infrastructure is put in place without other necessary support mechanisms. implement the plan with careful monitoring and evaluation along the way. UNESCO has also identified the essential components to ensure plans succeed. Set clear and realizable goals. Set up a coordinating agency between ministries and divisions. Give full stakeholder support and alignment. Create a clear timeline and resource mobilization plan. Put in place systematic monitoring and evaluation systems to ensure sustainability. In Asia, UNESCO is helping three countries, Nepal, Philippines and Uzbekistan, develop a national ICT training framework for teachers. It has also helped Nepal launch a master plan based on UNESCO’s strategy, covering the period 2013 to 2017. The plan targets four priority areas: infrastructure development, human resources and teacher development, creation of digital learning materials, development of an education data system. An effective ICT in education master plan reflects and closely aligns with a country’s vision and goals for education. Political will and government commitment over the long term are key to ensure follow-through to the end of the process. Collaboration among government ministries involved in the development process (education, finance, ICT) is essential for effective planning and implementation. Countries should focus on no more than five priority areas for each master plan cycle and these should reflect specific local needs and conditions. The benefits of physical infrastructure, including connection to the internet won’t be felt unless teachers are adequately trained to use it and relevant content and curricula are developed. Carefully prepared resource plans which take into account the cost of physical infrastructure, teacher training, content development, maintenance and all other aspects of operating an ICT system are crucial given that the cost implications of getting it wrong are huge. Effective and systematic monitoring and evaluation of ICT systems must be put in place to provide knowledge on what works and what doesn’t. Park cited a project in a country that involved the purchase of 400,000 tablets at a cost of $32 million for distribution to students in Grade 1 was started in 2012. After 6 months, another 1.3 million tablets were purchased for secondary school students. After only a year of the project just 729 out of 24,098 schools were using the tablets, and the government scrapped the project altogether in 2014. J Park. Trends and Development of ICT in Education Policy. Slideshow presentation at the Knowledge Sharing Program on ICT in Education of Asian Development Bank. Seoul. 9-11 November 2016. UNESCO Bangkok. ICT in Education. Jonghwi Park provides policy support and other technical assistance to member states on developing ICT in education master plans. She has a master’s degree in educational technology from Hanyang University, Republic of Korea and doctorate in learning sciences from McGill University, Canada.